Bright golden straw pink color. Fruity, attractive aromas and flavors of peaches in cream and nougat with a silky, crisp, dry-yet-fruity light-to-medium body and a graceful, amusing, medium-length finish with touches of green apple, honeyed lime, and minerals with crunchy, fruit tannins and no oak flavor. A vibrant, tangy pinot gris that will really shine at the table. Bottom Line: A vibrant, tangy pinot gris that will really shine at the table. 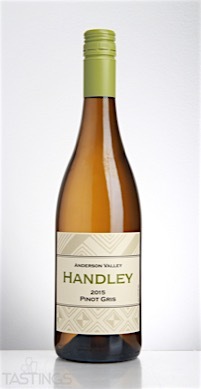 89 • Handley 2014 Estate Vineyard, Chardonnay, Anderson Valley 13.2% (USA) $25.00. 84 • Handley 2013 Water Tower, Chardonnay, Mendocino 14.1% (USA) $18.00. 91 • Handley Cellars 2013 Pinot Noir, Anderson Valley 13.8% (USA) $32.00. 93 • Handley Cellars 2014 Estate Vineyard, Chardonnay, Anderson Valley 13.2% (USA) $25.00. 86 • Handley Cellars 2013 Estate Vineyard, Pinot Noir, Anderson Valley 13.8% (USA) $47.00. 91 • Handley Cellars 2014 Estate Vineyard, Chardonnay, Anderson Valley 13.2% (USA) $25.00. 93 • Handley Cellars 2015 Estate Vineyard Rosé, Pinot Noir, Anderson Valley 13.1% (USA) $25.00. 88 • Handley Cellars 2015 Pinot Blanc, Mendocino County 13.4% (USA) $22.00. 92 • Handley Cellars 2015 Estate Vineyard, Chardonnay, Anderson Valley 13.1% (USA) $25.00. 89 • Handley Cellars 2015 Estate Vineyard, Gewurztraminer, Anderson Valley 13.5% (USA) $22.00. 91 • Handley Cellars 2015 Pinot Gris, Anderson Valley 13.6% (USA) $20.00. 87 • Handley Cellars 2016 Estate Vineyard Pinot Noir Rosé , Anderson Valley 13.2% (USA) $25.00. 93 • Handley Cellars 2014 Pinot Noir, Anderson Valley 13.9% (USA) $32.00. 88 • Handley Cellars 2014 Estate Vineyard, Pinot Noir, Anderson Valley 13.6% (USA) $47.00. 88 • Handley Cellars 2014 RSM Vineyard, Pinot Noir, Anderson Valley 13.6% (USA) $52.00. 91 • Handley Cellars 2016 Pinot Gris, Anderson Valley 13.6% (USA) $20.00. 88 • Handley Cellars 2014 Zinfandel, Anderson Valley 14.8% (USA) $25.00. 93 • Handley Cellars 2016 Estate Vineyard, Chardonnay, Anderson Valley 13.3% (USA) $25.00. 90 • Handley Cellars 2015 Pinot Noir, Anderson Valley 13.8% (USA) $32.00. 92 • Handley Cellars 2015 Estate Vineyard, Pinot Noir, Anderson Valley 13.2% (USA) $47.00. 91 • Handley Cellars 2015 RSM Vineyard, Pinot Noir, Anderson Valley 13.4% (USA) $52.00. 94 • Handley Cellars 2017 Pinot Gris, Anderson Valley 13.2% (USA) $25.00. Pinot Gris is the same grape as Pinot Grigio, but when a wine is identified as a Pinot Gris, it is generally a more full-bodied, more complex, more age-worthy wine. The best examples of Pinot Gris come from Alsace in northeastern France and Oregon. These wines are have excellent weight on the palate, good acidity and ripe apple and pear fruit with a distinct spiciness and a dry finish. Most examples are aged only in steel, but some producers in Alsace will age Pinot Gris in large, older wooden casks, which can add a touch of spice as well as additional texture. There are also some sweeter versions of Pinot Gris produced in Alsace; these are labeled as vendange tardives or grains nobles. 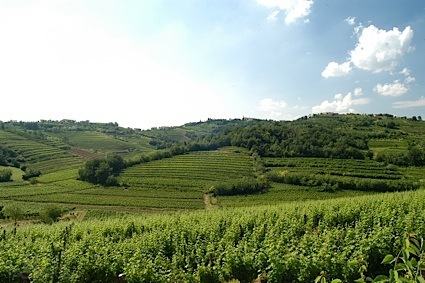 There are also versions of Pinot Gris from the far northwestern Italian region of Valle d'Aosta as well as from California. Consume most versions of Pinot Gris at an early age, from two to five years. The finest versions of Alsatian Pinot Gris (from Grand Cru vineyards) can be enjoyed at 15-20 years of age. Food pairings that work well with Pinot Gris include smoked fish, sushi, Asian cuisine, chicken with cream sauce or veal, pork or poultry with mushrooms. Handley Cellars 2015 Pinot Gris, Anderson Valley rating was calculated by tastings.com to be 91 points out of 100 on 11/15/2016. Please note that MSRP may have changed since the date of our review.